Acrylic nails are the most common artificial nail extension used on the planet as they are quite durable and they adhere to natural nails like they were your own. Building acrylic nails has became an art – especially if combined with all the forms of nail art available. At ProfessioNAIL we are masters of the trade, with almost half a century experience. 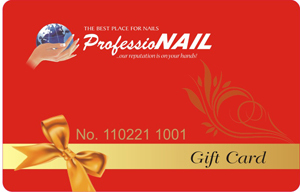 The designs available at ProfessioNAIL make the nails look astonishing and personal, giving a glamorous touch to your hands. You might think that acrylic nail enhancements are a new emerging trend of the last two decades, however, nail extensions have been available for centuries. For example, Egyptians were the first to introduce artificial nail extensions.In their culture long nails were considered a symbol of wealth as well as a matter of exquisite fashion. Ancient Egypt is notoriously known to be the pioneer in many aspects of the cosmetic industry. In these modern times, acrylic nails are requested for many different reasons besides the mere fashion factor. People who have brittle and weak nails may require the application of acrylic nails as they are made of resilient material and will help the natural nails not to snap. Those who are in the habit of biting their nails may also want acrylic nail extensions because they are hard to chew off. Acrylic nails are also the best solution, more so than gel nail extensions for those who want long nails and are can’t grow their natural ones. But more than any other consideration acrylics nails are a matter of fashion. They can be combined with glitter, nail art, 3D nail art and much more, giving a client an unique and personalized effect. Long nails are absolutely alluring. They are an ideal element for a wedding, party, or special occasion. These days many women wear nail extensions on a regular basis as part of their fashion routine – and, of course, many trust ProfessioNAIL!